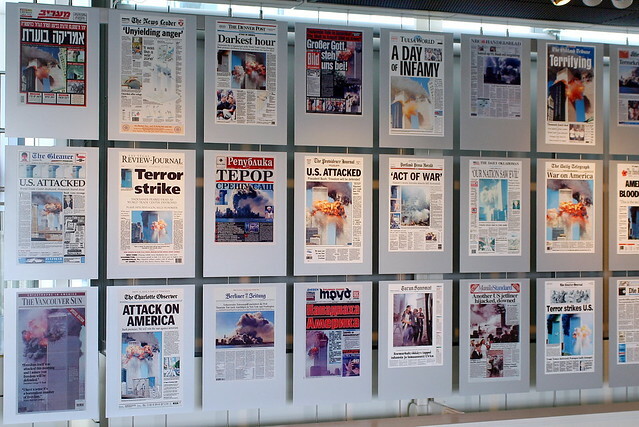 The Society for News Design’s Best of Newspaper Design winners from the 23rd Edition related to the 9/11 terrorist attacks. Matt Mansfield's article brought it all back and really is a great composite of who and how to do it right. The Society for News Design’s Best of Newspaper Design™ winners from the 23rd Edition related to the 9/11 terrorist attacks. 9/11 We Will Never Forget | Flickr - Photo Sharing! 50/50 : day 9 - September 11, 2011 This is the New York Times and The Washington Post issues from September 12, 2001 that I saved from my hotel room. I was in Washington, DC for training that week. From my building, I could see the Pentagon up in flames. What a painful day 9/11/2001 turned into. I still get chills every time I see footage of the World Trade Center buildings falling. I will never forget that day. Where were you on 9/11? The graphic explaining who worked in the World Trade Center was a quick way to identify whether you might know someone who was in the attack. 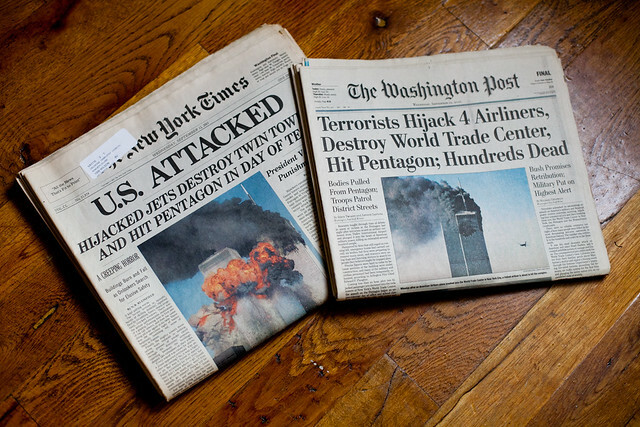 Three years after 9/11, SND asked visual journalists to reflect. This video was shown at the annual workshop in San Jose. Five years after 9/11, The Virginian-Pilot's Sam Hundley made this effective cover, which won a Gold award at the Best of Newspaper Design. The New York Times produced helpful mapping that gave residents a sense of safety following the 9/11 attacks. 9/11 Front Page Gallery | Flickr - Photo Sharing! ust after 9/11, SND produced a special edition of its newsletter, Update, that looked at the design of the news in the days immediately following. SND Vice President Jonathon Berlin was then an editor for the publication, which was distributed at the Society's annual workshop in Phoenix just a few weeks after the terrorist attacks. Click this link to download the entire issue. The story of the Sept. 11, 2001, terrorist attacks on New York, in the words and images of photographers working that day. Thomas E. Franklin of The Bergen Record made one of the iconic images from the attacks of three fire fighters raising a flag amidst the rubble of the collapsed World Trade Center. To mark the anniversary, Franklin interviewed several of the photojournalists who were there that day for the following documentary. Firefighters at Ground Zero, Sept. 11, 2001 | Flickr - Photo Sharing! This photo, first published in The Record newspaper in Bergen County, NJ, was taken by Award winning photojournalist Thomas E. Franklin. It has touched the lives of many. Along with generating emotion, it tells a very powerful story. I personally was so moved by the photo that shortly after it had been published I wrote to The Record, where Franklin was the staff photographer, to request a copy, which I did obtain. Proceeds from the sale of the photo and licensed products now benefit the North Jersey Media Group Foundation's Disaster Relief Fund (http://www.njmgf.org/initiatives/index.php) and The Bravest Fund (http://www.bravestfund.com/). The flag is the primary focus in the photo, and its colors contrast against the gray rubble. The photo captures the dust in the air, creating a blurred effect, while the flag and the firemen’s faces are sharp. Though you don’t clearly see the faces of the three firemen, the photo portrays their seriousness. Remembering the heroes | Flickr - Photo Sharing! 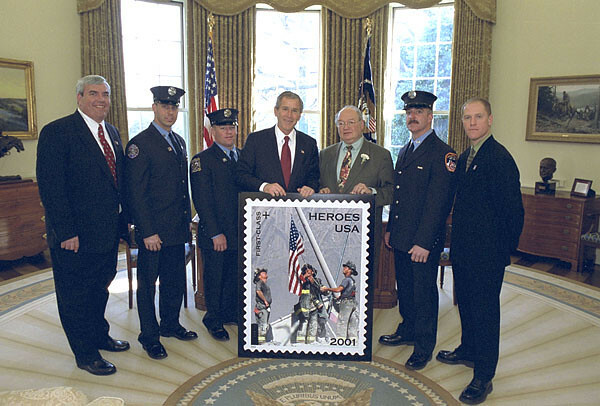 President George W. Bush stands for photos at the unveiling of the Postal Service's new stamp Commemorating the efforts of recovery workers in the aftermath from the attack upon the World Trade Center, President George W. Bush unveils a new stamp in the Oval Office March 11, 2002. Standing with the President from left to right are Postmaster General Jack Potter, Firefighter Bill Eisengrein, Firefighter George Johnson, Congressman Gary Ackerman, Firefighter Dan Williams and Photographer Thomas E. Franklin. White House photo by Tina Hager. Enhancing communication around the world through excellence in visual journalism. The mission of the Society for News Design is to enhance communication around the world through excellence in visual journalism. Get out of the way: When there’s documentary photojournalism that tells the story, the designer should keep it simple. Typography should not detract from the image(s). The goal should be to show, then tell. This applies in print and online. Explain the unseen: The reason the graphics from The New York Times worked so well? They transported the audience to new places for contemplation and connection. When possible, use graphics to illuminate the places the audience cannot access. Tell stories about concepts and connections this way, too. Trust your instincts: Your audience is at least as smart as you are, probably smarter. Count on your viewers or readers to be thinking people. Be aware of that. Especially in a crisis and because information can flow so quickly, it’s imperative to be thoughtful. In fact, that’s maybe the biggest lesson of all. September 11, 2001 is an event that we will never forget. Alongside the many brave human heroes, we should also remember and honor the quietly heroic Search and Rescue (SAR) dogs who, along with their handlers, risked their lives to help save victims of the World trade Center attacks. Design a logo for 9/11 Curator which is a pubic user ID at BagTheWeb. Are you a 9/11 Curator?Join us to build a large online museum for the past and for the future.